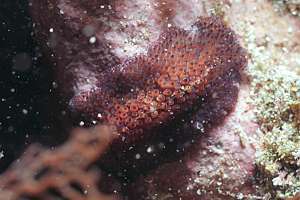 This page details the lower animals, the molluscs, seasquirts, cnidaria (anemones) and sponges found on the New Zealand intertidal rocky shore. 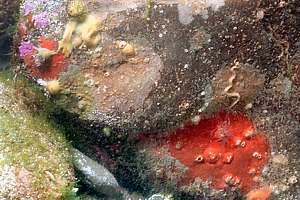 sponges: sponges of the intertidal rocky shore, blobs and carpets. Marine worms often do not look like worms at all. 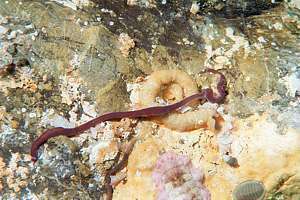 On land most visible worms are roundworms (Drilo spp), but in the sea one finds segmented worms, flatworms and others. 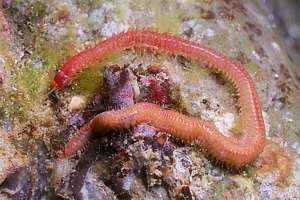 The segmented worm is the most advanced, as fish and higher order animals evolved from it. 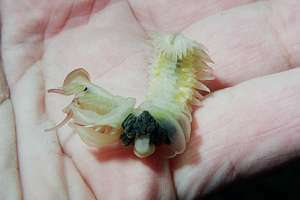 f050211: the parchment worm (Chaetopterus variopedata) has suddenly spread far and wide as our seas became overnourished. 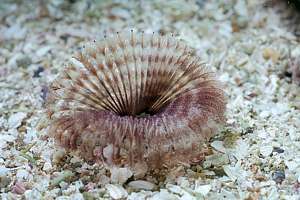 It is easily confused with the sand fanworm but has a thin, tapering tube ending in a narow white funnel. The animal sits well back from this opening. f025805: a parchment worm peeled out of its tube, shows what a complicated animal it is with its many functional legs. The ones in the middle are used for fanning (pumping) water through the tube. Between the mouth on left and the black middle, it spins a slime bag with which it continuously catches plankton. See indepth02. f050625: the sand fanworm (Sabella sp) has a long tube that often goes too deep to be dug up. It never opens up fully, keeping it cup-shaped as shown. 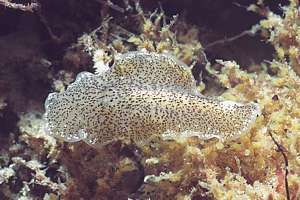 Its tube is rubbery and narrows into a slit when the animal has withdrawn deeply into its tube. It must be a strong burrower, as it extends its tube deeper and deeper while growing. f050827: the purple sand fanworm (Branchiomma sp) lives in clear, exposed coarse sand and does not open up symmetrically, one side higher than the other. It is also oval in shape. This is a very shy fanworm with an eye at the end of each feather. f018912: an unidentified double-crowned tubeworm, perhaps related to Pomatocerus. (Pomatoceros terranovae?) 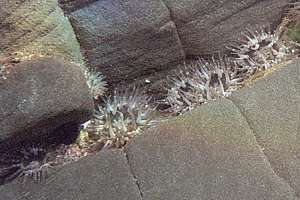 The white dots and spirals on the rock are Spirorbid tube worms. 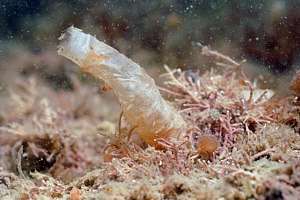 These tube worms are also called keelworms for the sharp keel on their tubes. f960311: toothed chalky fanworm (Pomatocerus caeruleus, Spirobranchus cariniferus) [toke pa] has two blue fans protected by a hard and very sharp tooth. It is the main cause of lacerations to wetsuits and skins. proboscis worm (Saccoglossum otagoensis) is a 1.5cm small worm found from Wellington southward. Its mouth has a collar from which it extends a red proboscis or tongue. f051616: red segmented bristleworm or ragworm or sea centipede (Perinereis novaehollandiae) [weri moana] is a fierce predator of small organisms like amphipods and shrimps. But it fears many predators. f051622: red bungee worm (Amphitrite rubra) is a bristleworm that burrows into the sand from where it extends its many red tentacles over the surface, drawing whatever it can find towards its mouth. 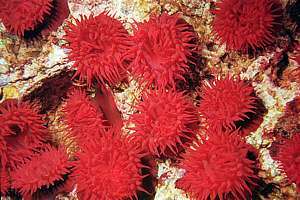 The red tentacles can extend far out, resembling bungee cords when retracting. f019019: red nemertine worm or ribbon worm. 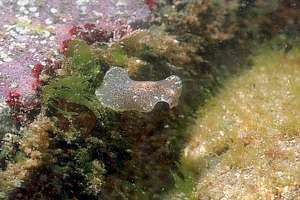 f037004 nodulose flatworm (Thysanozoon brochii) [toke papa]. f017217: nodulose flatworm (Thysanozoon brochii) free swimming. Found on the east coast of the North Island. f039531: speckled flatworm (Stylochoplana sp.) crawling with ease over difficult terrain. It can swim quite purposefully and elegantly. f032519: speckled flatworm swimming freely. In this picture one sees the thin hollow green filaments of the gut alga (Enteromorpha intestinalis). The green algae on left are one of the sea lettuce species (Ulva sp). 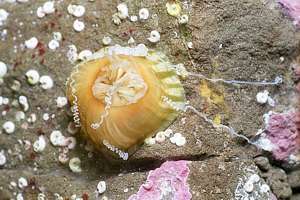 The cnidaria have many diverse forms, like jellyfish, sea gooseberries, sea pens, anemones, corals and hydrozoa. We'll also include the bryozoa or polyzoa here. All have stinging cells with which they can stun and catch prey, even though many cannot punch through a human skin. 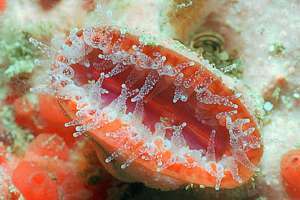 The cnidaria have a single internal cavity (stomach) and a mouth surrounded by stinging tentacles. Food enters through the mouth and wastes are expelled through it. 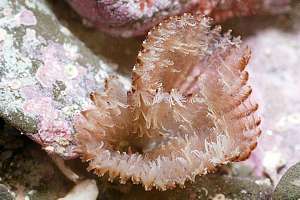 Many cnidaria are able to secrete a hard skeleton (corals, gorgonians). 0608213: olive actinia anemone (Isactinia olivacea) likes to live in the burrows of piddock shells, and any place where it can withdraw fully. 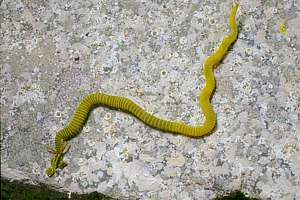 It is common on the West Coast where its colour is usually brown but it is also found in emerald green. f019331: red actinia or beadlet anemone (Isactinia tenebrosa) [kotare moana] lives under high tide level where it is threatened by pollution but it can still be numerous on remote islands. It prefers the shaded sides of vertical rock faces. 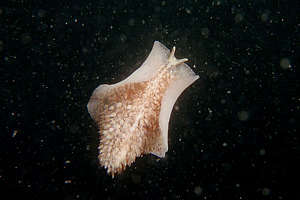 When exposed, it has its tentacles withdrawn, looking like a glistening dark brown blob. 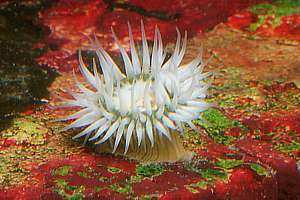 It is also called beadlet anemone for the round beadlets between tentacles and stem. Up to 40mm. f050326: speckled camouflage anemone (Oulactis mucosa) is almost invisible because of its camouflaging colours. In closeup it shows an extravagant display of rainbow colours. In the South Island it is much larger, often with a red oral disc. This anemone is often camouflaged in shell fragments and pebbles, stuck to its column. f960327: mud anemone (Anthopleura aureoradiata) is a small anemone living in narrow cracks. It is also found on burrowing clams like cockles. It has green plant cells in its tissues that convert solar energy to food. Its column is rough with warts. Anthopleura aureoradiata: warts large and fused at the top of the column, disappearing at the base. Small 10-30mm. Brown and white and yellow markings. Common on mud flats and tide pools. 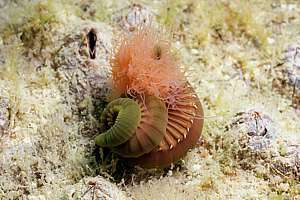 Anthopleura inconspicua: white or pink column, tentacles brown and white with pink or orange bands. Anthopleura rosea: pink tentacles, disc white to pink, column cream or orange. 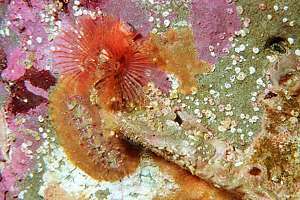 Anthopleura minima: dark red column, tentacles and disc brown and white with pink spherules. 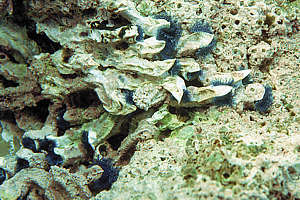 Common in mussel beds. 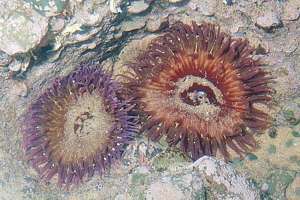 Diadumene neozelanica is a brown anemone with a white/brown striped column, brown tentacles and red mouth. South Island. the brooding anemone (Cricophorus nutrix) is a small 15mm anemone found on large brown algae. 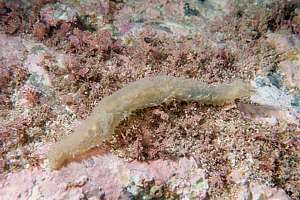 It usually has a brown smooth column with thin brown tentacles. Oral disc iridescent or variously coloured. Mouth border pink, green or white. The young are carried in an external brood pouch. the jewel anemone (Corynactis haddoni) has transparent tentacles with knobbed ends. It reproduces by splitting, creating carpets of identical clones. See our tribute to the jewel anemone with many images /images/jewel.htm. 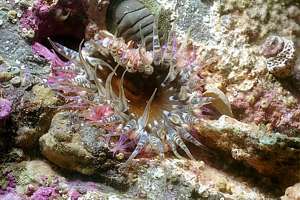 Epiactis thompsoni is a medium to large wandering anemone with red and white stripes on its column. 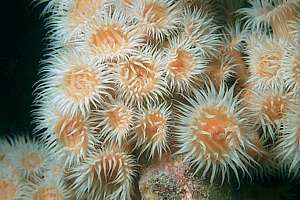 Its tentacles are arranged in cycles, coloured dull green brown or grey, with mauve or pink tips. Oral disc is red or red-brown. South Island. f981812: a West Coast rock pool full of colourful sand dahlias (Oulactis magna, Isocradactis magna). 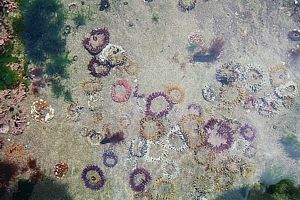 These giant shore anemones can grow large and in many colour variations - white, grey, blue, purple, pink, yellow, green, brown. 0608214: sand dahlia (Oulactis magna) can live in highly exposed places. With sticky tubercles on its stem it holds shell fragments to protect itself from being sand-blasted. f021313: white-tentacled anemone (Actinothoe albocincta) is the most common anemone below low tide where it can form solid patches of cloned individuals. 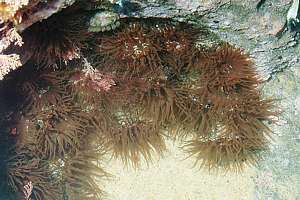 However, it is not common on the intertidal even though it can stand rough water. On closer inspection its column has perforations surrounded by tiny suckers. This clump of anemones is growing over a warty seasquirt (Microcosmus kura), not visible. f050633: with its tentacles withdrawn, the white-tentacled anemone looks like a striped yellow/green blob. When annoyed, it shoots stinging threads from its stem, that can inflict painful stings, itching for weeks. An overdose of stings can lead to a serious traumatic condition. 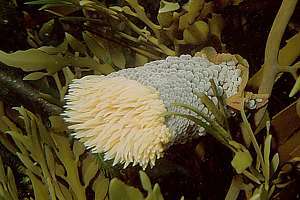 f052237: Actinothoe albens is a white anemone with a smooth column and no suckers on its column. f027219: Phlyctenactis tuberculosa, [kotore moana] the large wandering anemone has corn-like tubercles on its extensible column. It feels very soft to the touch and its column won't sting. It is found in calm waters where it wanders from seaweed to seaweed. It mainly comes out at night to catch nocturnal zooplankton, or it reaches down to sweep the sea bottom. Its column is highly variable in colour: pink, mauve, grey, green, brown, orange. f049433: fan coral (Flabellum rubrum) [pungatea] forms a hard limestone cup with ribs inside, into which the animal can withdraw. By night it extends its tentacles to catch zooplankton. Its colours are orange, red and pink. It is a NZ native animal. f019018: two encrusting colonies of bryozoa (mats) vying for space. Bryozoa are the smallest of flower animals and they are often not clearly visible. Each lives in a tiny box and has a lid to close it once withdrawn inside. f032515: a bryozoan mat is often almost impossible to distinguish from a carpet sponge. 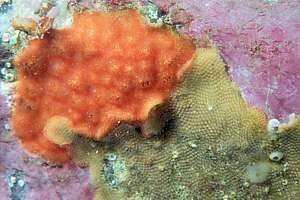 The beige mat top left is a bryozoan mat whereas the red mat in the lower right is a carpet sponge. Hydroids are cnidaria that form thin stalks from which the polyps sprout. Many are almost transparent and small. the mussel beard (Amphisbetia bispinosa) [kawekawe] is a colonial hydroid, golden brown in colour and usually found on greenlipped mussels. 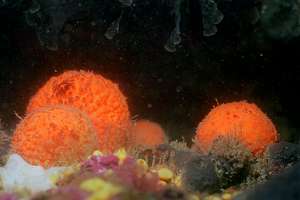 Sponges are colonies of single-celled individuals organised into recognisable shapes with often unique colours. They can have many shapes: carpets, blobs, trees, vases, pipes and so on. Most sponges do not prefer to live in the intertidal and all like to be submerged most or all of the time. Sponges grow only slowly and most are not capable of competing with plants, so they are found in dark places and in deep water. Many sponges can grow very old. 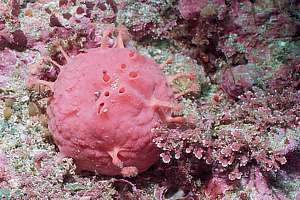 f033724: the pink golfball sponge (Tethya ingalli) likes to live in bright light. In fact, it does not survive long without. Here it has formed tentacles ending in knobs which are splitting off to form new sponges. f050216: the golden golfball sponge (Tethya aurantium) [porotaka moana] can also live in the light but on the rocky shore it is found in dark places underneath large boulders. This is a native sponge.